Mobile County 96 follows a combination of Beverly Jefferies Highway east from the Mississippi state line to Prine Road, overtaking it from Mobile County 21. Prine Road becomes State Street, carrying County Road 96 to U.S. 45 (3rd Street) opposite an unsigned branch of Mobile County 41. The county road resumes along LeBaron Avenue east to Main Street and the Coy Smith Highway en route to Mt. Vernon. Mobile County 96 ends at U.S. 43 from the west in Mt. Vernon as a signed route. An unsigned route exists along Old Military Road east of the town limits through and onto State Landing Road to the J.E. Turner Boat Ramp on the Tombigbee River. Eastbound Mobile County 96 pentagon posted after the merge with Prine Road at the northern terminus of Mobile County 21. Photo taken 05/09/09. An old style U.S. 45 junction shield stands along CReet) eastbound within Citronelle. 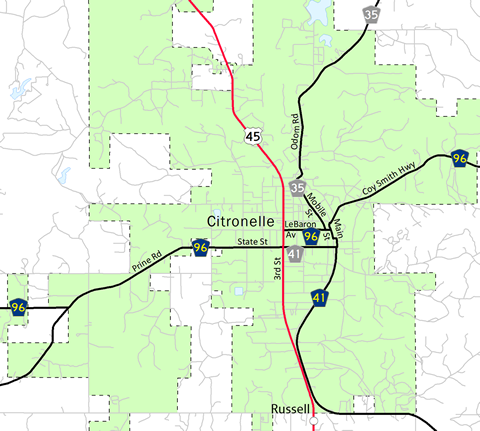 The city limits of Citronelle actually start several miles to the west of this meeting near the center of town. Speed limits drop to 35 mph upon entering the city. Photo taken 05/09/09. The junction shield pictured above is the only signage in place along State Street east for U.S. 45. U.S. 45 follows 3rd Street through the main commercial strip of Citronelle. Main Street however parallels the railroad line east from U.S. 45 through the original town center at State Street (Mobile County 41). Photo taken 05/09/09. Mobile County 96 follows Lebaron Avenue east from U.S. 45 (3rd Street) to Coy Smith Highway / Main Street, junction Mobile County 41 south. Photo taken 05/09/09. Bent Mobile County 41 pentagon directing drivers southward onto Main Street at the east end of Lebaron Avenue. Photo taken 05/09/09. Turning onto the Coy Smith Highway, Mobile County 96 begins its 14.5-mile journey east to U.S. 43 at Mount Vernon. A blue guide sign is posted in lieu of a eastbound reassurance shield after the intersection with Mobile County 41. Photo taken 05/09/09. An older one-piece four-way flasher hangs above the Military Road (old CR 96) intersection with Old Highway 43. Old Highway 43 parallels a Norfolk Southern Railroad line along the west edge of Mt. Vernon. Photo taken 01/02/11. 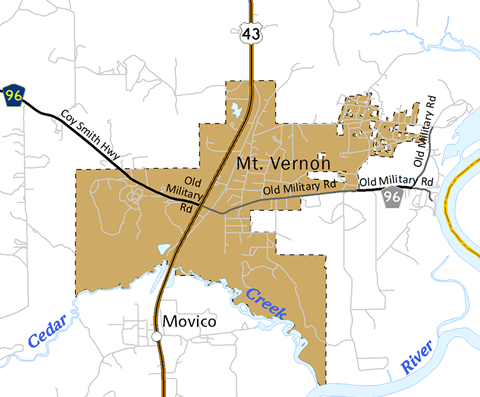 Military Road becomes county maintained as unsigned Mobile County 96 east of Shepard Lake Road and the Mount Vernon municipal line. Photo taken 01/02/11. Unsigned County Road 96 ends at the split of Military Road into State Landing Road east to the J.E. Turner Boat Ramp and Old Military Road north to Fort Stoddard. Photo taken 01/02/11. State Landing Road leads directly to the Mobile River and a boat ramp facility. Photo taken 01/02/11. A short unsigned segment of County Road 96 links State Landing Road with Shepard Lake Road at the Mount Vernon line. Local maintenance takes over Military Road westward to U.S. 43. Photo taken 01/02/11. Former CR 96 west followed Old Military Road south from Railroad Street in Mt. Vernon to Military Road west from Old Fort Stoddard. The old county road meets Old Highway 43 after its crossing of the Norfolk Southern Railroad. Photo taken 01/01/10. A short distance west of Old Highway 43 is U.S. 43. U.S. 43 constitutes a four-lane divided highway south to Axis and Satsuma and north to Calvert and Wagarville. Photos taken 01/01/10. County Road 96 commences west of the Military Road intersection with U.S. 43 to Coy Smith Highway and Citronelle. Photo taken 01/02/11. Patillo Road spurs south from Mobile County 96 (Coy Smith Highway) to Calcedeaver Elementary School before petering out in a forested wetland area. Photo taken 01/01/10. A reverse white on black U.S. 45 trailblazer posted ahead of the Mobile County 96 westbound turn from Coy Smith Highway onto Lebaron Street in the city of Citronelle. Lebaron Street carries the county road west to U.S. 45 in unsigned fashion. Photo taken 05/09/09. Where Mobile County 96 turns onto Lebaron Avenue, Mobile County 41 begins on Main Street south. The county road continues the road south to Newberry Crossing east to Center Street south. Eventually the route follows Celeste Road southward to Saraland. Photo taken 05/09/09. Mobile County 96 west turns southward in an implied overlap with U.S. 45 (3rd Street) to make the connection between Lebaron Avenue and West State Street. West of U.S. 45, Mobile County 96 continues to Prine Road and Beverly Jeffries Highway west to Mississippi 594 near Leakesville. Photo taken 05/09/09. One block west of Coy Smith Highway is the Mobile County 96 (LeBaron Avenue) intersection with Mobile Street. Mobile Street is unsigned Mobile County 35 leading north to Sims Chapel in Washington County. Photo taken 06/01/10.